The Irene Hotel is on the main road one mile from the village of Gouves on the north coast of Crete. Just a five minute drive away is the popular resort of Hersonissos and the nearest beach is 700 metres from the Irene Hotel. There are supermarkets, bars and restaurants just 100 metres away. The Hotel Irene is a family-run property offering a friendly Greek welcome, as well as 34 spacious guestrooms. 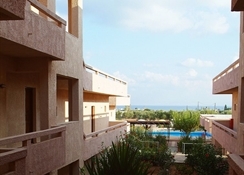 All rooms have air conditioning and a balcony or terrace. There is a lovely swimming pool and a convenient pool bar set amongst the palm and olive trees in the lovely hotel gardens. Gouves is a smaller and quieter resort, with a pretty old town and a sandy beach. The seafront area has a selection of cafes, bars and restaurants and the town, small boutiques and souvenir shops. The nightlife in the resort is low key and relaxed.